NLCS Game 2: Clayton Kershaw starts, Kenley Jansen saves, Dodgers win. CHICAGO — Clayton Kershaw kept a remarkable streak alive in the Dodgers’ 1-0 win over the Chicago Cubs in Game 2 of the National League Championship Series on Sunday: The Dodgers haven’t lost a postseason game in which he pitches, and they haven’t won a game in which he doesn’t pitch. Kenley Jansen answered questions about his stamina by recording a six-out save. In today’s notebook: Andre Ethier might step in against (more) left-handed pitchers in the series, and Adrian Gonzalez didn’t lament the Dodgers not staying at Donald Trump’s hotel in Chicago. 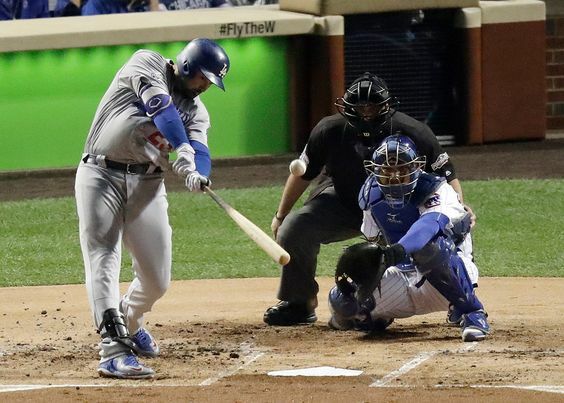 This entry was posted in JP on the Dodgers, Playoffs, Postgame thoughts and tagged Adrian Gonzalez, Chicago, Clayton Kershaw, Cubs, Kenley Jansen, NLCS, playoffs by J.P. Hoornstra. Bookmark the permalink.